Home / Why Should I Wear Synxsole? Synxsole orthotics have been designed and developed by two Australian podiatrists who have over 22 years of combined experience in orthotics and human biomechanics. Synxsole orthotics are premium consumer and practitioner orthotics that provide support, shock absorption and comfort to help realign the foot and lower limb and ease pain. The Synxsole creators believe that prevention is the key and aim to help others live active, healthy and pain-free lives by delivering a new level of comfort to people on the move. HOW CAN SYNXSOLE HELP ME? Enhanced comfort: Across all activities including standing, walking, running, jumping and more! 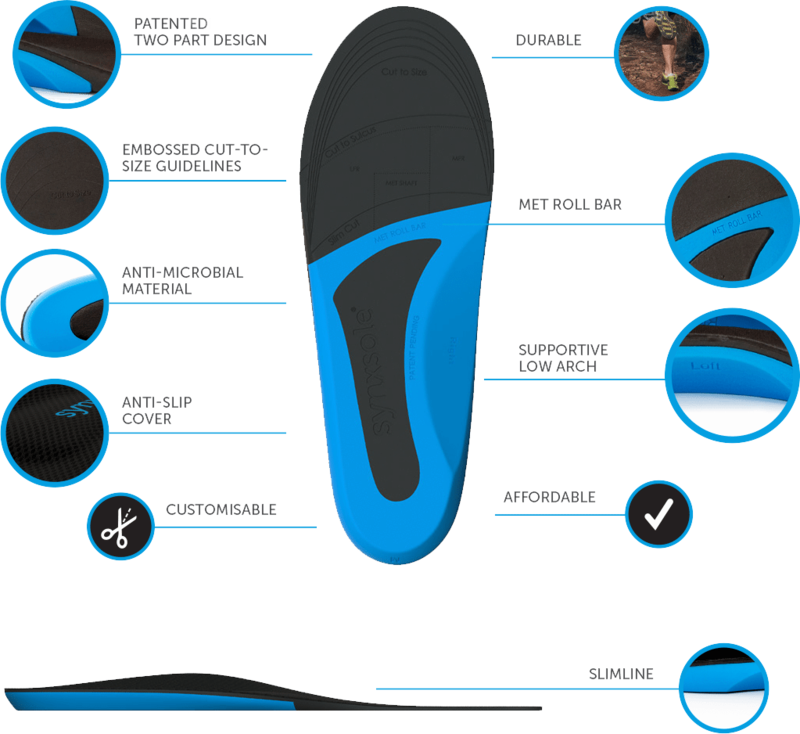 Synxsole orthotics are the ‘one stop insole’ for all your needs. Our patented, slim design helps align your body, support your feet and lower limbs, as well as protect your joints. With prevention in mind, Synxsole helps to keep the foot in the most ideal neutral position whether at work, sports or play. The specifically for the growing and developing foot, Synxsole Kids is the safest and most superior insole for children on the market. The neutral design helps to gently support the arch of the foot whilst also preventing/reducing common conditions experienced during childhood. The slim and soft design allows for natural movement of the foot required for a wide range of activities and an easy fit into school shoes and sporting boots. Why Keep your body in Synx? because ultimately, your feet and your body will thank you for it!